Many months ago I burned out UART2 on Data Bus' mbed microcontroller. I'm adding a new serial-based sensor for obstacle detection and the original mbed is all out of ports (one for GPS, one for the LCD display and one for the USB serial connection). 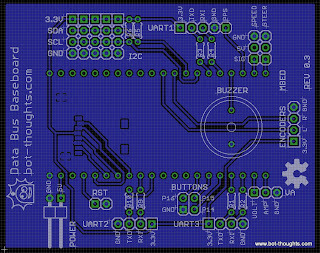 A new mbed is on order from Sparkfun (I put off spending $60 as long as I could) and it will be plugged into a revised baseboard, connecting it to all Data Bus' sensors and actuators. 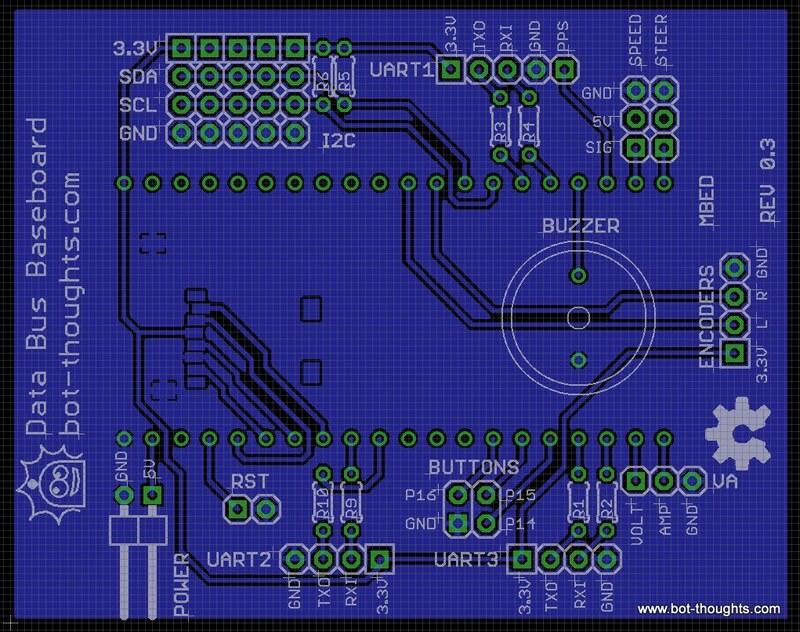 It's smaller, has an integrated microSD card slot, a built-in buzzer for audio feedback and status, inline resistors on all the UARTs (to prevent burning them out again) and will have nice laser-printed silkscreening instead of sharpie scribblings like the current board. In other news, I haven't made much progress increasing the robot's speed. As soon as I upped it a few m/s, several issues cropped up that have to be addressed before further increases are possible. I've been working on position estimation refinements. After the robot updates heading estimate with lagged GPS data, it now updates current heading and position based on that estimate. That required converting all the code to using cartesian coordinates instead of latitude, longitude. I'm also working on a way to deal with gyro bias. I haven't had much luck so far. Part of the problem is that the robot is extremely sensitive to initial heading; there's a steady state error that isn't being corrected. As a result, the gyro bias compensation doesn't work properly. I did some test runs at SFE on Monday and met Team Viator. Their robot made several successful runs around the building. I'm happy to report Data Bus made its first autonomous trip around the building with a final position error of only a couple meters. Yay! On the downside, that was the only success out of several attempts. The steady state heading errors, as well as a faulty left wheel encoder system, resulted in all kinds of failures. I went out to sparkfun Monday as well. From 4- 8, only our last run made it all the way around. I notice our GPS losing signal all together on 3 of the 4 sides of the building. Since GPS is our main navigation sensor this may be very bad for us. Its programmed to continue on with just inertial navigation from the gyro and accellerometor, but when GPS gets its signal back it seems to make it veer badly. I dont have the time or money to try another gps, so we are just going to hope for the best. It workes so good at the park when there are no buildings blocking the sky. What GPS are you using? I think there's some wicked multipath interference on the west side of the building. Use the Contact Me link on the blog; I will share an idea that seems to improve reception (reported SNR) by about 5-10dB; it may at least get you 3 out of 4 sides of the building. Also you can borrow my 1Hz Sirf III GPS if it will help.